Part of what makes Game Bibs so great is seeing all the passionate sports fans rocking our bibs at games across the country. 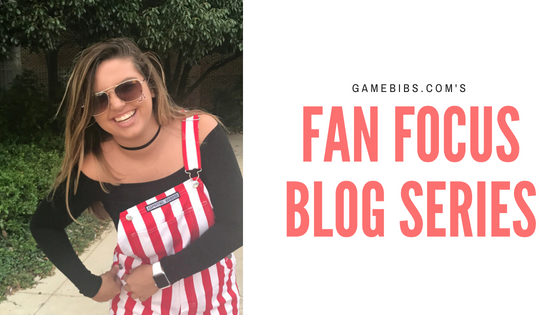 Whether you're accessorizing with your favorite outfit or letting your bibs do the talking, we couldn't be more pleased to see Game Bibs across social media and TVs all over the country! To celebrate our customers and avid sports fans, we're putting together a "fan focus" blog series to learn more about you all. Our first bib-wearing superfan is Gema, a college student from Alabama! I bought them last year for the Alabama Homecoming game! Of course tailgating on the quad and drinking yellow hammers! "Dixieland Delight" or "Sweet Home Alabama." Shaker, game day pin, and my phone. Probably a game day pin.. they’re very popular in the South. Sadly, I wasn’t geared up in Game Bibs but I did go to the Chick-fil-A Kickoff this past season and that was my first Alabama game! Roll Tide! Just to have fun! Bama is ready to win the championship again. My favorite sports movie would have to be The Benchwarmers! This is a tough one...either Dustin Pedroia or Jalen Hurts (always have to go with the Bama pride) Roll Tide y’all! Thanks for taking the time, Gema! Do you want to be featured in our Fan Focus blog series? Leave us a message on one of our social media channels and we'll be in touch!